Easy rolling mold on polyurethane tread chemically bonded to heavy cast iron core. Polyurethane wheel is floor protective; non marking, non staining and non conductive tread. Poly tread also is resistant to oil, grease, water, and most solvents. Polyurethane tread measures 90-95 Shore (A) Durometer. Available in a variety of colors. Select the ideal bearing option; matching the mold on polyurethane wheel bearing to your application. 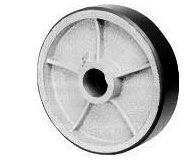 Call toll free 1-888-904-9531 for information and to order polyurethane wheels. NCC-PUR3415 3-1/4 1-1/2 1-5/8 1-3/16 500 5/8 and 3/4 "
NCC-PUR3420 3-1/4 2 2-3/16 1-3/16 600 5/8 and 3/4 "
NCC-PUR415 4 1-1/2 1-5/8 1-3/16 600 5/8 and 3/4 "
NCC-PUR420 4 2 2-3/16 1-3/16 700 5/8 and 3/4 "
NCC-PUR515 5 1-1/2 1-5/8 1-3/16 800 5/8 and 3/4 "
NCC-PUR520 5 2 2-3/16 1-3/16 1200 5/8 and 3/4 "
NCC-PUR525 5 2-1/2 2-3/4 1-15/16 1400 1 and 1-1/4 "
NCC-PUR530 5 3 3-1/4 1-15/16 1600 1 and 1-1/4 "
NCC-PUR615 6 1-1/2 1-5/8 1-3/16 800 5/8 and 3/4 "
NCC-PUR620 6 2 2-3/16 1-3/16 1200 5/8 and 3/4 "
NCC-PUR620-1 7/16 6 2 2-3/16 1-7/16 1300 7/8 and 1 "
NCC-PUR625-1 3/16 6 2-1/2 2-3/4 1-3/16 1500 5/8 and 3/4 "
NCC-PUR625 6 2-1/2 2-3/4 1-15/16 1600 1 and 1-1/4 "
NCC-PUR625-3 1/4 6 2-1/2 3-1/4 1-15/16 1600 1 and 1-1/4 "
NCC-PUR630 6 3 3-1/4 1-15/16 2000 1 and 1-1/4 "
NCC-PUR820-1 7/16 8 2 2-1/4 1-7/16 1400 7/8 and 1 "
NCC-PUR825-1 3/16 8 2-1/2 2-3/4 1-3/16 1600 5/8 and 3/4 "
NCC-PUR825 8 2-1/2 2-3/4 1-3/16 2000 1 and 1-1/4 "
NCC-PUR830 8 3 3-1/4 1-15/16 2500 1 and 1-1/4 "
NCC-PUR840 8 4 4-1/4 2-7/16 3800 1-1/4 and 1-1/12 "
NCC-PUR1025-1 3/16 10 2-1/2 2-3/4 1-3/16 1600 5/8 and 3/4 :"
NCC-PUR1025 10 2-1/2 2-3/4 1-15/16 2200 1 and 1-1/4 "
NCC-PUR1025-3 1/4 10 2-1/2 3-1/4 1-15/16 2200 1 and 1-1/4 "
NCC-PUR1030 10 3 3-1/4 1-15/16 3000 1 and 1-1/4 "
NCC-PUR1040 10 4 4-1/4 2-7/16 5000 1-1/4 and 1-1/12 "
NCC-PUR1225 12 2-1/2 2-3/4 1-15/16 2500 1 and 1-1/4 "
NCC-PUR1225-3 1/4 12 2-1/2 3-1/4 1-15/16 2500 1 and 1-1/4 "
NCC-PUR1230 12 3 3-1/4 1-15/16 3500 1 and 1-1/4 "
NCC-PUR1240 12 4 4-1/4 2-7/16 5500 1-1/4 and 1-1/12 "
NCC-PUR1630 16 3 3-1/4 1-15/16 4400 1-1/4 and 1-1/12 "